...and sadly, I haven't mixed up any new concoctions. I'm so boring. I mix some distilled water, a few drops of lavender oil, glycerin and a drop of hair conditioner in a spray bottle, shake it up and spray it on my hair. That's it. Booooring! I looveeee purple and now I'm going to go get one of those polishes for my bridesmaids since it's my wedding color, thanks! I haven't made anything recently but I did just order something new for my skin, we'll see how it works out, lol. plum it looks cute! 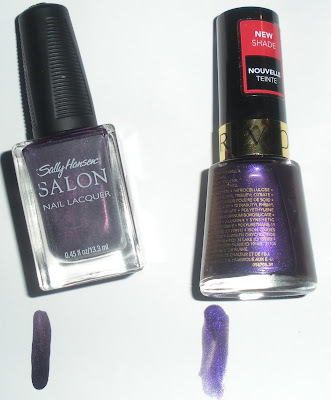 i might pick that up because im lookfor for a dark shade but i dont necessarily want black. it's funny, im wearing a purple short-sleeved turtle neck right now. purple is def. the it color for this fall (and spring) and i couldnt love it more! My boss is wearing purple toes today! I want to try it on my nails too! i loove shea butter too!! 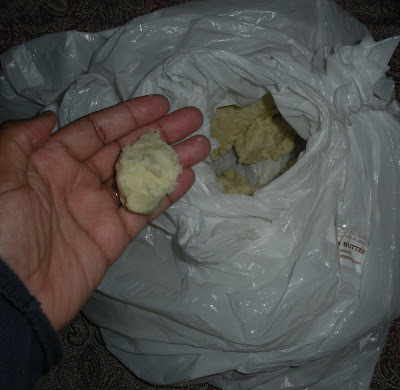 I called myself trying to whip shea butter. Didn't work. I just started using it on my hair again. When I take my twists out, I will see if it help with the dry hairitis I was dealing with. P.S. M.A.C. wants me to work for them because they liked the way I did my makeup (soooo wasn't expecting it). Last week they didn't have any open positions, but when I went in today to turn in my app., the manager told me that one has come available and will call to schedule an interview this week. Keep me in your prayers!! I know purple's the in color, but I'm feeling bright red for fall. @Byes so to have dark nails and my precious bings, I'm set. I'm waiting on your new concoctions:-) and I seriously need to get some glycerin. @RenRen I am with you on the wine...love it. @TM oooh pretty I have seen purple in weddings maybe twice so pretty. @BGG it would look too cute on you. @Amina when you have a concotion that you love I will certainly link to it just let me know. @Jewells I hope the shea works well for you. On another note...what what what you mean I would have blog access to a real MAC pro...WHOOOOA * jumps up and down* I so want you to get that job. I am wishing you all the best. YAY YAY. @PBW I'm sure red would look awesome on you. You new site design is so pretty!!!! you can substitute with any oils that you have. There are a bunch of youtbe videos on making shea butter products so just search away and have a blast.